We hope that you can join the hundreds of our student clients from around the world who have won admission to top universities in the United States. This year alone, our students entered such reputed institutions as the University of Pennsylvania, Dartmouth, Cornell, Carnegie Mellon, Duke, University of Illinois-Urbana Champaign, UT Austin, Texas A & M, University of Utah, University of Minnesota, U-Mass (Amherst), USC, North Carolina State University, Arizona State and Virginia Tech. We offer world-class college counseling services at extremely reasonable rates (see fees section below). Our block rates are 60% lower than the competition, plus all of our sessions come with a 100% satisfaction guarantee. If you don't like one of our sessions, the counseling is on us - you simply do not pay. No questions asked, no gimmicks, no fine print. If you live in the Dallas area, you could come to us or we could come to you at no additional cost. For other families worldwide, we use secure video conferencing (Skype, Google Hangouts) along with cloud-based technologies for all of our one-on-one counseling sessions. Our lead counselor is Rajkamal Rao, the founding Managing Director of the firm. Please check out his bio here. To check out public reviews, please type "Rao Advisors LLC" in Google, or feel free to ask any of our 200+ followers on our Facebook page. What do you get as part of individual counseling? We like to think of ourselves as the Amazon of college counseling! We provide a full suite of services - high school course planning, college readiness, college selection, and admissions strategies, financial planning, advice for demonstrating student interest in colleges, structured essay reviews - from when your child is in the 8th grade to when the last college admissions offer is received. We create a detailed customized roadmap for each child for all remaining high school years including structured plans for how to spend summer months, when best to schedule the various tests, how to prepare for tests at the lowest cost and how to free up a student's time so that there is sufficient school-life balance. 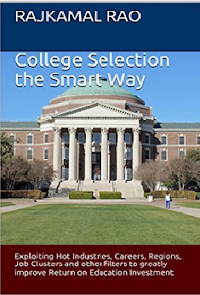 Plus each family receives our popular, proprietary 210-page guide to elite college admissions which is the content source for our public appearances, books, and flagship online courses. Families have free access to this website along with regular updates on our Facebook page. Finally, families can join our growing WhatsApp community. The following is a sample list of topics we cover during our sessions, tailored to the needs of your student. How do we define a student’s interests and develop a personal brand? Which high school courses/tracks/endorsements/DLAs/PA’s should we aim for? What are dual credit courses and what are the benefits? AP/IB/Both? When? How many AP courses? How to develop a brag sheet? How do we balance work experience/internship/extracurricular activities into the student profile? How do we exploit the Coalition’s free tools? What are key planning milestones, grades 9 – 12? Which states/regions to avoid because co-op/internship chances may be fewer? 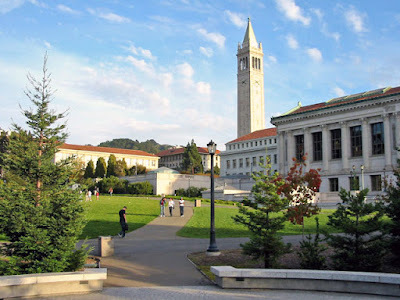 Why may an out of state private college be less expensive than studying in-state? How much should we rely on college rankings? Which reputed resources are the best to conduct college research? Which types of colleges should we avoid? What are three innovative ways to lower college costs? How do we group colleges into Dream, Core, and Safe buckets? 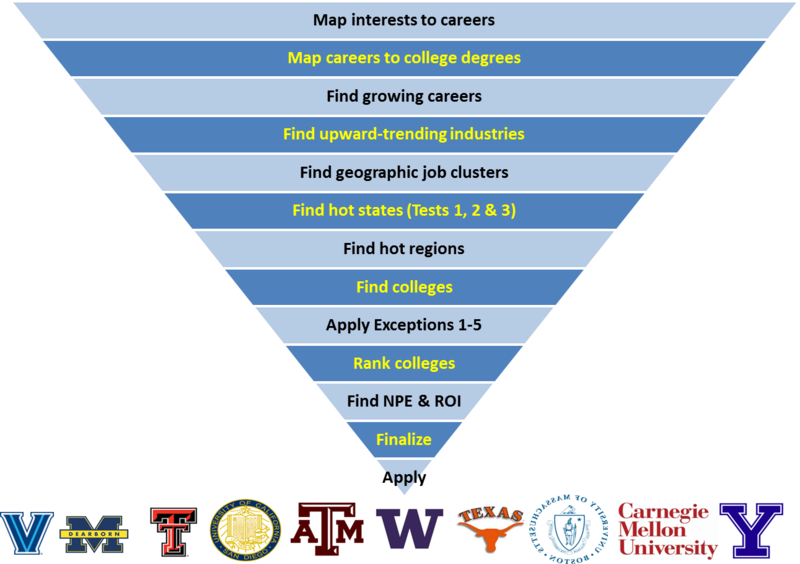 What selection factors are relevant to finalizing colleges? What’s the difference between Subjective & Objective pieces of an application? How do we analyze Net Price Estimates? How do we conduct scholarship searches? From whom should we get recommendation letters? How do we maximize the potential of a LinkedIn profile? Common Ap or Universal College Ap or Coalition Ap or individual college ap? What application strategies should we employ - Rolling, EA or ED? 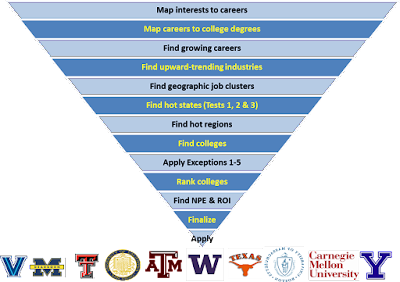 What modern tools can we use to predict and improve college acceptance? 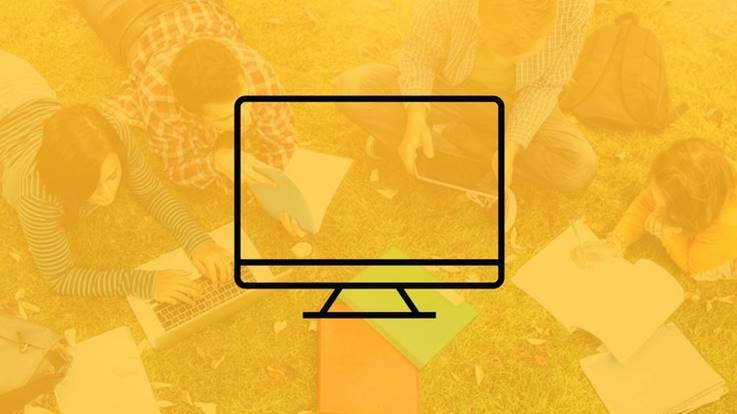 What online tools can we leverage to visit schools? How do you prepare for campus visits? How can we help you successfully write winning college essays? What social networking tools can we employ to learn about others’ profiles? How does America pay for college? How to leverage new FAFSA rules, including the IRS Data Retrieval Tool? How to take advantage of federal tax credits and deductions? How to avoid making common mistakes throughout the process? How expensive are professional counselors? Tier A. If you hire us on demand, our rate is $119/hour. Your child can be in any grade. Tier B. 11th & 12th graders: If you commit to us, by handshake, that you will engage us as your trusted advisor throughout your child's high school career, our rate is $109/hour. Tier C. Younger grades: The handshake rate is $99/hour. We're in the business of trust, so our trusted advisor agreement is simply made in good faith the old-fashioned way. No written contracts, no rules, no minimums. The $109 and $99 rates above are assuming that you pay by cash, bank deposit or check. College counseling requires both online sessions and off-line sessions (such as during essay/resume reviews or course planning). Online sessions include in-person, video, phone and chat conversations - any medium where we are engaged with you to address questions specific to your case. Questions asked on public boards (like our Facebook page or on our WhatsApp group) are usually not billable because these are deemed general questions. We will always provide an estimate before doing off-line work and will only begin work after getting your approval. If you want us to create a customized tool for you to track your student's weighted average GPA but you intend to not engage us for anything else at present, we have a service for that too. We're so confident about the value that you will get that if you're not happy with the services you received, you just don't pay us for that session. Period. The counseling is on us. If you spend at least $400 with us - and if you're a do-it-yourself kind of family - we will give you a copy of our popular flagship guide so you don't even have to do future research on your own should you decide not to return. Plus, you will get our popular college planning workbook - in the cloud - customized for your student which will serve as the main communication platform throughout our engagement should you decide to return. And our website and Facebook page are loads of information, all free and updated several times a week - so it will make it even more easy for you. We work hard to win your trust. We are very responsive, often getting back to you in a matter of minutes. Our workday begins at 7 AM and ends at 11 PM. We're open weekends and holidays. We counsel by Skype. We make house calls and discuss your child's situation in the comfort of your living room at no extra charge. 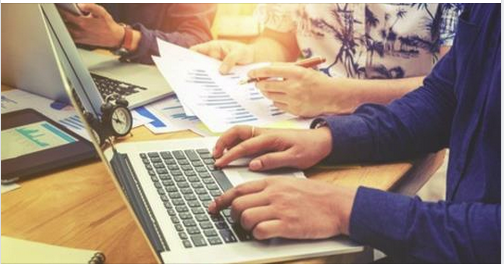 Our essay review process is among the best - after all, the lead reviewer is a weekly international columnist for India's second largest financial newspaper! Summary: Up to 2½ hours of one-on-one counseling in a private, secure video conferencing environment. [No free introductory counseling minutes]. We make extensive use of Google Apps for Business in the cloud and email. All interactions are secured using 128-bit encryption. Not every minute of the 2½ hours is spent with the client - a substantial portion is spent by us offline, such as when finalizing the branding sheet or doing SOP reviews. Our fees for the 2½ hours: $349. Branding: We will help you define your profile and interests, identify your higher education needs and evaluate other options. For example, if you are a Mechanical Engineer, should you be studying in Germany where tuition is free? Field Selection Strategies (i.e. map interests to careers): We provide advice regarding the field of study that best exploits US market conditions. For example, should you consider a Professional Science Masters program in the US? Which industries are hot? What are work visa restrictions? For example, it is not a good idea to pursue Aerospace Engineering because many jobs require US citizenship. Find US States and regions that are economically strong: Not all US states are equal. We will help you find company concentrations and job clusters in hot states and regions. The premise is that if you are educated at a college nearby, you will become a local candidate with specific skills and thereby more easily get an internship or a job. Subjective Criteria Strategies: We will counsel you on how to write strong SOPs and optimize your recommendation letter strategies. We provide advice regarding composing resumes and cover letters, including providing you with free templates to make it easier. Work Flow and Task Plan: We will provide you with a detailed checklist of when to do what until you are ready to apply for your visa. We will also provide two detailed original presentations with all the information you need to be successful. Most slides are linked to our website for additional detail. Statement of Purpose (SOP) Review: We will professionally review and make offline edits to no more than three essay revisions. Note that your SOPs will only be reviewed by our founder, Rajkamal Rao, who is an accomplished author of 4 books. [Mr. Rao is an international columnist for The Hindu BusinessLine, India's second largest financial newspaper. Click here for an archive of his opinion pieces. He has also been writing a weekly column, "World View", for the paper's online portal for MBA students since April 2015]. [If the only assistance you need from us is to review your SOPs, our fees are $179. You will still get all of our flagship guides including, how to successfully apply to U.S. graduate schools, how to pursue higher education in Europe and Commonwealth countries and how to develop your SOP]. We don't review cover letters and resumes. Some restrictions apply. Additional Hours: You can buy additional hours of counseling (including for visa advice) at $99/hour. Are Private Counselors Necessary? How Much Do They Charge? Hiring a counselor is a private decision but increasingly, a lot of US families are doing just this. According to U.S. Department of Education data, in 2015-16, each public school counselor was responsible for 476 students, on average. On average, public school counselors spent 22 percent of their time on post-secondary counseling in 2014, while their private school counterparts spent 55 percent of their time on college counseling. This places public school students at a disadvantage. According to Ruth Starkman of Stanford, private college admissions consulting is a booming industry that offers to help families navigate the often confusing and stressful process of college admissions. Although many public universities provide application seminars, post-application tips on their websites and distribute guidelines to high school counselors, the demand for applications advice often exceeds the capacities of most public institutions. In 2013, 26 percent of all college applicants — three times as many as in 2003, hired a “private admissions consultant” or an “independent educational consultant (IEC)” to assist with their college applications. Mark Sklarow, CEO of the Independent Educational Consultants Association (IECA), says that consultants charge an average rate of $160/hour. Typical cost: $4,500 spread out over 3 years. The typical client is a middle-class or upper-middle-class student in a public school. KD Academy, the popular college test preparation site charges for a block of services. Their 10th-grade pricing is reported to be a flat rate of $6,000 where you commit to them for 24 hours of counseling - this works out to $250/hour. Their ad-hoc, on-demand pricing is $450/hour. Check out our post on how KD's services are remarkably similar to our own but are orders-of-magnitude overpriced. Why Are Our Fees Low? Our fees are much lower because we are an online company which can pass savings on to you. For example, we don't rent expensive office space or hire needless overhead resources. We don't advertise - all our growth is from word-of-mouth client referrals for which we are forever grateful. We conduct most of our business online using cloud tools, lowering our costs of delivery. We reach a global audience and our volumes are higher. We earn revenue through ads on our site which further help subsidize your fees. We get revenue from sales of our college selection book and our online courses. Finally, our fees are structured to get you everything you need - from college selection strategies to completing the first full application to a school - for one low price. But our pricing is flexible to accommodate those who want additional help. We are also the Southwest Airlines of college counseling. We hate to say "No" to our clients!